Final Cut Pro X (iTunes link) features a "Magnetic Timeline" that lets users edit on a flexible, trackless canvas. It also boasts "Content Auto-Analysis" that categorizes content upon import by shot type, media and people. New background rendering also allows users to work without interruption. The software, available only on the Mac App Store in Mac OS X, is built on a modern 64-bit architecture. "Final Cut Pro X is the biggest advance in Pro video editing since the original Final Cut Pro," said Philip Schiller, Apple's senior vice president of worldwide product marketing. "We have shown it to many of the worlds best Pro editors, and their jaws have dropped." 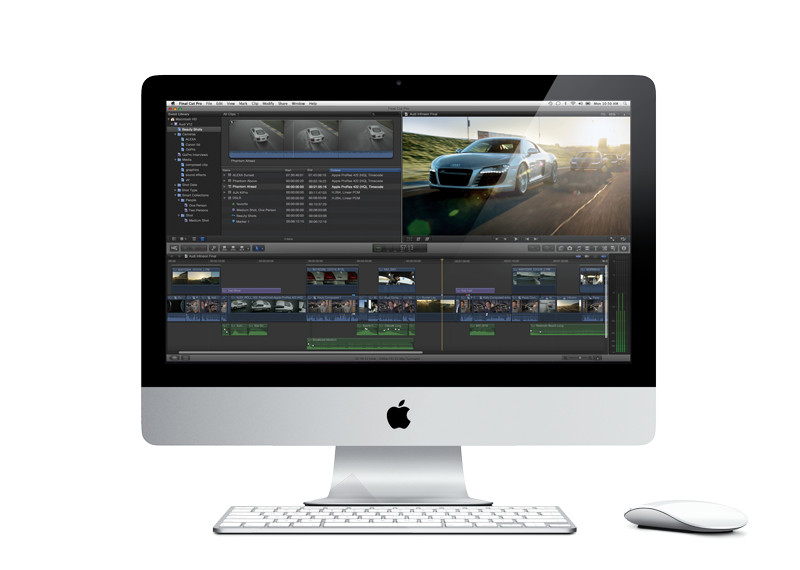 Final Cut Pro X's "Magnetic Timeline" is a trackless approach to editing footage. It allows users to add and arrange clips wherever they want them, while other clips instantly slide out of the way. "Clip Connections" can be used to link primary story clips to other elements like titles and sound effects, so they stay in perfect sync when they are moved. Related story elements can be combined into a "Compound Clip" that can be edited as a single clip. The new "Auditions" feature also allows users to swap between a collection of clips to instantly compare alternate takes. "Content Auto-Analysis" will scan media on import and tag content with useful information. Final Cut Pro X then uses that information to dynamically organize clips into "Smart Collections," so the clips can easily be discovered by close up, medium and wide shots as well as media type and the number of people in the shot. Parts of clips can also be tagged with Range-based keywords to add custom search criteria to media. Completely rebuilt from the ground up, Final Cut Pro X is a 64-bit app that takes full advantage of the latest Mac hardware and software, and even provides performance enhancements with 4K video. 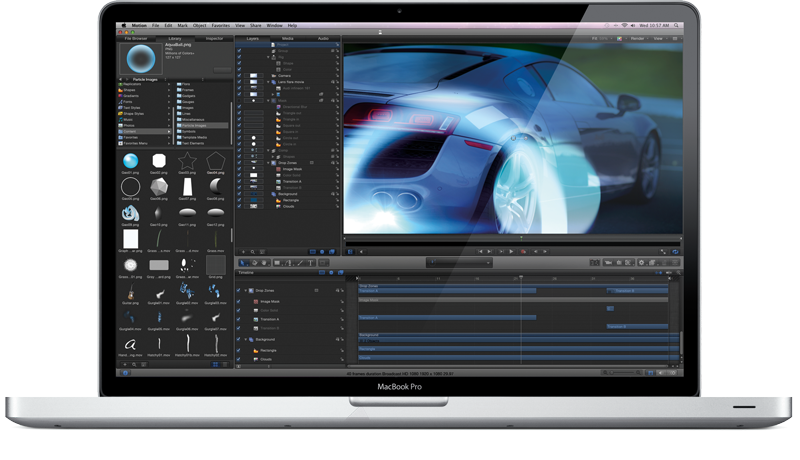 Final Cut Pro X uses multi-threaded processing and the GPU for faster background rendering and real-time playback performance. Additionally, a ColorSync-managed color pipeline ensures color consistency from import to output. Final Cut Pro X also includes tools for audio editing and color correction, and is complemented by two companion apps, Motion 5 for professional motion graphics and Compressor 4 for advanced media encoding, available from the Mac App Store for $49.99 each. "Im blown away by what Apple has done with Final Cut Pro, said Angus Wall, Academy Award-winning film editor. "Final Cut Pro X is incredibly modern and fast, but most importantly it lets you focus on telling your story in the most creative way, while it actively manages all of the technical details." Magnetic Timeline automatically keeps material in sync, prevents clip collisions, and eliminates gaps. Clip Connections keep secondary material in place while trimming and moving the Primary Storyline. Choose to hide or display Clip Connections in the timeline. Compound Clips allow complex compositions to be simplified into a single clip. Auditions combine multiple clips into a single clip to see alternative takes, color grades, or effects in context. Edit while importing media in the background. View material in Filmstrip or List view with a mini-filmstrip and metadata columns. Skimming functionality enables fast viewing of large amounts of material. Skimmable projects in Project Library enable viewing before loading. Mix frame sizes, frame rates, and formats in the same timeline up to 4K in real time. Edit at 23.976, 24, 25, 29.97, 30, 50, 59.94, or 60 fps. Create the correct project setting with the first edit. Insert, Overwrite, Replace, Append, and Connect with keystroke or drag and drop. Extend edit to Skimmer position. Split edits with J and L cuts in the timeline. Top and Tail in a single keystroke for news and documentary editing. Direct access to iTunes, iMovie, iPhoto, and Aperture through Media Browsers. Timeline Index for timeline navigation and the selection of items based on text searches and other important metadata. Position tool for moving and deleting media in the timeline and leaving gap. Snapping to Playhead, Skimmer, Clips, and Markers. Inline Precision Editor allows skimming of media around the edit before trimming. Add multiple effects and transitions within a range selection. Use Open in Motion on any effect, modify in Motion, and save as new in Final Cut Pro. Copy and paste motion and effect attributes to multiple clips. Balance Color instantly improves skin tones, removes color casts, and expands dynamic range of bright and dark regions of the image. Create Camera Archives from any folder of media for importing into Final Cut Pro. Import Camera Archives from third-party video capture cards and software. Import from Apple devices including iPhone, iPod touch, and iPad 2. Import projects and Events from iMovie. Export as HTTP live streaming for Internet streaming to cellular, Wi-Fi, and broadband. Export audio as AAC, AC3, AIFF, CAF, MP3, and WAVE files. Content Auto-Analysis attaches useful metadata during import. Create Smart Collections for automatically organizing clips based on selected criteria. Mark ranges as Favorites or Rejects for sorting and sifting. Transcode Media function allows a choice between optimizing to ProRes 422 or creating ProRes Proxy media in the background while editing. Group clips by creation date, date imported, reel, scene, duration, or file type. Group Events by year or by year and month. Show date ranges in the Event Library. Arrange clips by name, take, or duration. Reveal clip in Finder or Event Browser. 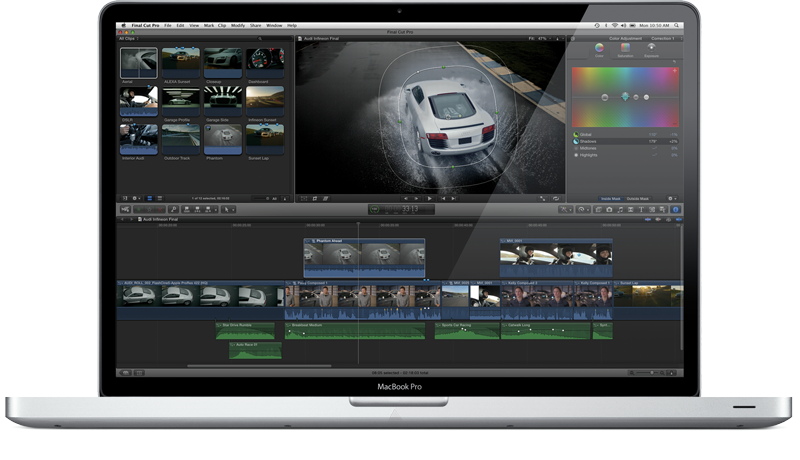 Final Cut Pro X is available today for $299.99 from the Mac App Store. Motion 5 and Compressor 4 are available today for $49.99 each from the Mac App Store. Full system requirements and more information on Final Cut Pro X can be found at apple.com/finalcutpro.